Get ready to enter Neverland and fly around with Tinkerbell as you and Peter Pan avoid Captain Hook and his pirate lackey here at Captain Hook’s Adventure Golf. 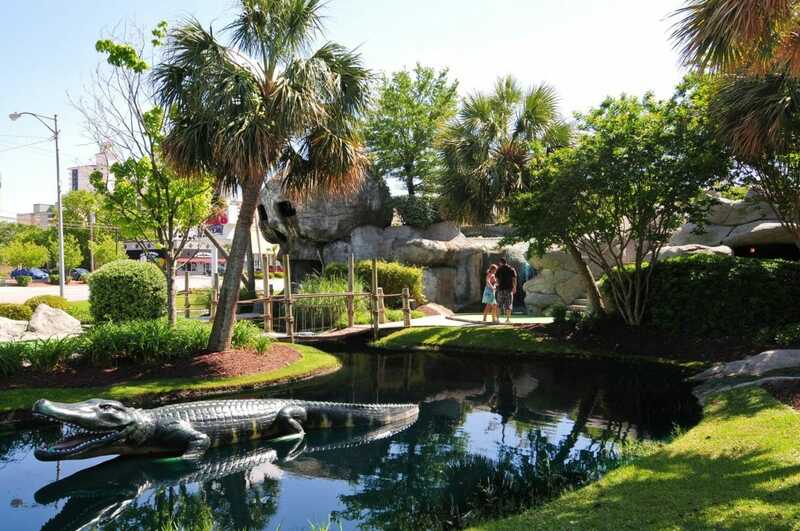 Within this family fun-filled miniature golf course you will find 2 different 18-hole courses filled to the brim with magical Peter Pan characters and scenes, from Captain Hook’s floating pirate ship to the Lost Boys hangout. You will become a part of the Darling family as you experience this enchanted island of eternal childhood, and you will have a lot of fun while doing so! There are several par 3 holes on this course, giving you excellent eagle and birdie opportunities, as well as the challenging and fun 6th hole aboard the ship. From the caverns with hidden treasure to the animatronic mermaids, this entire experience has earned itself the ‘Herald Readers’ Choice Award’ for 2017, earning its place as a staple entertainment center along Myrtle Beach's Kings Highway. If you can’t find Captain Hook’s, just look for the 15-foot smoking skull!